Funding for the Legal Services Corporation (LSC) would be cut by 26 percent in Fiscal Year 2012 under a proposal announced by the House Appropriations Committee on July 6. The Committee bill proposes a $300 million budget for LSC—rolling back LSC funding to a level not seen since 1999. Basic field grants, which are currently provided to 136 nonprofit civil legal aid programs across the nation, would be cut to $274.4 million, a 27.5 percent reduction from current funding of $378.6 million. LSC’s preliminary estimates show that about 235,000 low-income Americans eligible for civil legal assistance at LSC-funded programs would be turned away if the Committee proposal were enacted. “The proposed cut would prove to be especially damaging to low-income persons whose health and safety are at risk—the elderly, the victims of domestic violence, the disabled, children, veterans and others—by denying them access to justice,” LSC President James J. Sandman said. “At LSC programs, requests for assistance are increasing. The poverty population eligible for civil legal assistance has grown by 17 percent since 2008, to an all-time high of 63 million Americans. And funding from non-federal sources is decreasing. This is not the time to undercut the fundamental American commitment to equal justice for all,” Mr. Sandman said. LSC convened a national conference call on June 21 to hear from legal aid programs on the front lines responding to the tornadoes that hit Alabama, Mississippi and Missouri during April and May. This year’s storms have been the most deadly in decades. One of the most horrific tornadoes struck Joplin, Mo., destroying a hospital and more than 8,000 homes and apartments. The death toll has reached 153, according to news reports. 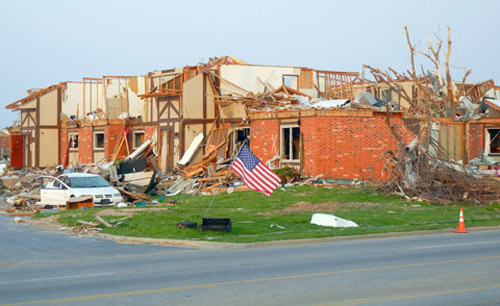 Tornado damage in Joplin, Mo., on May 22, 2011. Janice Franklin, Managing Attorney at the Joplin office of Legal Aid of Western Missouri said the LSC-funded program has been overwhelmed with clients seeking assistance with landlord-tenant matters and issues involving titles and deeds. The governor has set up a one-stop citizens’ center in Joplin, and the center refers rent-gouging cases to the Western Missouri program, Ms. Franklin said. Jimmy Fry, Executive Director of Legal Services Alabama, said more than 6,000 homes were destroyed across the state by tornadoes, and more than 200 people died. The program set up a hotline and dispatched staff members to disaster assistance centers, and the hotline has been instrumental in responding to requests for help with custody issues where a parent was killed and with housing issues where landlords were trying to collect rent on destroyed homes. The conference call was organized by John Eidleman and Elizabeth Arledge, LSC national disaster coordinators. On June 7, Eidleman traveled to Joplin to tour the disaster zone and meet with officials from Legal Aid of Western Missouri, including Janice Franklin in Joplin and Executive Director Gregg Lombardi and Deputy Director Shelly Wakeman in the Kansas City office of Legal Aid of Western Missouri. 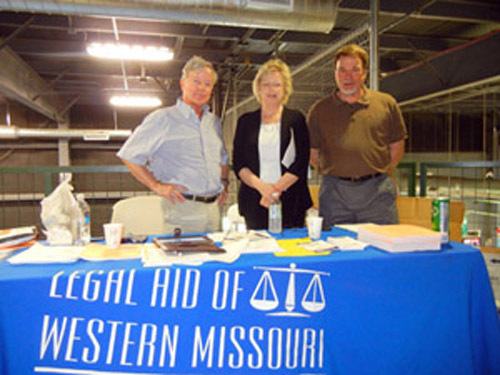 Janice Franklin (center), Managing Attorney at the Legal Aid of Western Missouri Joplin Office, standing with volunteer attorneys, Ron Bodison (left) and Bill Hays (right) of the law firm Shook Hardy & Bacon. “The devastation is shocking,” John Eidleman said. “Some areas have nothing but rubble and it is unclear what was there before. Other areas have part of buildings standing. None of the buildings are livable. All the foliage is stripped from the trees. Relief centers are set up on corners and offer free water and food. Ms. Franklin and Mr. Eidleman attended a meeting of provider organizations that was sponsored by the Federal Emergency Management Agency and attended by representatives of the American Red Cross, National Voluntary Organizations Active in Disaster, AmeriCorps and numerous community organizations and churches. Following the meeting, Ms. Franklin and Mr. Eidleman joined Tillie Lacayo of LSC for a visit to a disaster recovery center where they met with private lawyers from Kansas City and representatives of the Missouri Bar Association. Lois Curtis, one of the original plaintiffs in the landmark Olmstead disability rights case, and Sue Jamieson, an attorney with the Atlanta Legal Aid Society, met in the Oval Office with President Obama on June 20 to mark the 12th anniversary of the Supreme Court’s ruling. In the Olmstead case, the Supreme Court interpreted the Americans with Disabilities Act to require that states provide disability services in the community rather than in institutions. Ms. Curtis and another plaintiff, the late Elaine Wilson, had been confined to a state psychiatric hospital in Georgia, and they filed suit seeking disability services in the community. The case was brought by the Atlanta Legal Aid Society. Today, Ms. Curtis is a folk artist, and she presented President Obama with a self-portrait from her collection. The painting, “Girl in Orange Dress,” is one in a series of three pastel self-portraits that Ms. Curtis created because she has no photographs to mark her childhood. Representatives of the federal judiciary are inviting civil legal aid attorneys to participate in a project to develop the Next Generation Case Management/Electronic Case Files system. Electronic filing and docket management have revolutionized the federal court system, and the judiciary is exploring how to make the system more efficient and learn what changes attorneys, consumer groups, government agencies and others would like to see in the Next Generation version. Legal aid attorneys can help by submitting a comment or suggestion, completing a survey, and bringing ideas and concerns to their local clerk’s office. To learn more, go to www.nceb.uscourts.gov/asfrg. For more details, contact Mike Kopatich, Assistant Circuit Executive for Automation, U.S. Court of Appeals for the Tenth Circuit, at 303-335-3046. Cynthia Schneider, deputy director of LSC's Office of Program Performance, retires from LSC. Cynthia Schneider, Deputy Director of the LSC Office of Program Performance (OPP), is retiring. One of Ms. Schneider’s many duties as Deputy Director was to oversee the scheduling of OPP’s on-site program reviews and to work with staff preparing for the visits. OPP’s on-site program evaluations are used to ensure that LSC-funded programs provide high-quality civil legal services that are responsive to the needs of clients. Ms. Schneider also served as the coordinator of the Herbert S. Garten Loan Repayment Assistance Program (LRAP), which helps young lawyers in LSC programs who are burdened by law school debt. LRAP recipients range from new hires to attorneys with up to three years of service at their LSC-funded program. In Fiscal Year 2010, 94 attorneys in 51 programs received LRAP awards. Prior to joining LSC about 14 years ago, Ms. Schneider worked as a staff attorney at Legal Action of Wisconsin, the Food Research and Action Center, and the Migrant Legal Action Program. She began her career as a Reginald Heber Smith Community Lawyer Fellow, or Reggie. The fellowship is named after the author of the 1919 book, “Justice and the Poor,” which is often credited with starting the national legal aid movement in the United States. Sean Driscoll, special assistant in LSC's Office of Government Relations and Public Affairs and editor-in-chief of LSC Updates, leaves LSC. Sean Driscoll, the Special Assistant in the Office of Government Relations and Public Affairs and the editor-in-chief of LSC Updates, is leaving the Corporation after a decade of service. During his tenure editing LSC Updates, Mr. Driscoll greatly expanded the content and reach of the electronic newsletter. The newsletter provides the civil legal aid community, Congress and others throughout the legal profession with news about the LSC Board of Directors, the Congressional appropriations process, the work of local legal aid programs, and related material. He also selected material for distribution through @lsctweets, the Corporation’s account on Twitter. Mr. Driscoll also was the chief researcher for the Government Relations office and prepared briefing materials on LSC programs, budgets, regulations, and other matters that were vital to the work of the Board and the Corporation. Through a series of budget cuts and government funds drying up, many of the area’s nonprofit organizations have been hit hard and are facing cutbacks and possible closure unless support comes from some other source. Legal Aid of East Tennessee is one organization facing such cuts, and that might mean the closing of their Cleveland office — an office that handled 342 individual cases in the past year for Bradley County’s elderly, abused and low-income. The organization’s mission is to ensure equal justice for elderly, abused and low-income people by providing them with a broad scope of civil legal assistance and advocacy. “Many of the people we serve have no other place to turn,” said LAET Executive Director Dave Yoder. Five weeks after Legal Services of New Jersey pleaded poverty at a legislative hearing, the Assembly is taking up a measure that would bump up court filing fees to help fund the legal aid provider. The bill, A-4197, introduced [June 27], also would help fund the judiciary's establishment of an e-filing system that would abate reliance on paper. The sponsor, Assemblyman Peter Barnes III, D-Middlesex, says: "It's nowhere near ready to be moved, but we thought it was important to [introduce] the bill ... in light of what's happened to Legal Services." The agency has been forced to cut staff and accept fewer clients in the face of a shrinking budget. Arkansas Children’s Hospital (ACH), Walmart and the Arkansas legal community [on June 17] announced a partnership to provide legal services to hospital patients and their families at no charge. Known as a medical-legal partnership, or MLP, the pro bono corporate initiative is the first of its kind in the country. Under the partnership, Legal Aid of Arkansas and Walmart will provide legal assistance to patient families at clinics set up at ACH, as well as during inpatient visits. Direct access to legal services will help many families address obstacles to good health and continuing recovery. What Happens if Your Ex Abducts Your Child? For nine gut-wrenching years, Texan Greg Allen has been trying to track down his daughter after her mother absconded to Mexico with the 4-year-old during a rare unsupervised visit after the couple's contentious divorce. "When it first happened, I was unable to function," recalls Allen, 42, an electrical engineer and sonar expert doing doctoral research at the University of Texas' applied research laboratories in Austin. "I went from being a single parent whose whole life revolved around raising my daughter to being a left-behind parent whose purpose in life was gone." Last year, at least 1,500 children were unlawfully taken to foreign countries by a parent who had been living in the United States, including children who were taken even while a parent was serving in the U.S. armed forces in Iraq or Afghanistan. Only 578 abducted children were returned to the United States. Many of the children - roughly one-third - ended up in Mexico because of the parent's ties to extended family or Mexico's proximity. Raun J. Rasmussen has been selected as the next Executive Director of Legal Services NYC by the group’s Board of Directors. Since 2003, he has served as the Chief of Litigation and Advocacy for the New York program, which is among the largest civil legal aid programs funded by LSC. Mr. Rasmussen took office on June 27, succeeding Interim Executive Director Michael D. Young, who was elected Vice Chair of the Board of Directors in May. Mr. Rasmussen began his career as a housing attorney at South Brooklyn Legal Services, a program of Legal Services NYC. He later became South Brooklyn’s Director of Litigation, helping to develop a foreclosure prevention project designed to combat predatory lending practices and creating the Child Care Network Support Project, which continues to provide legal services and training to home-based child-care providers. Click here to read the Legal Services NYC announcement. Jacquelynne Bowman, Deputy Director at Greater Boston Legal Services since 2000, has been chosen as the nonprofit program’s next Executive Director. She succeeds Robert Sable, who is retiring after 20 years of service. Ms. 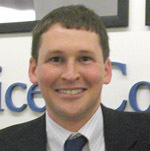 Bowman, a policy expert on domestic violence and child welfare issues, serves on numerous task forces and commissions, including the Massachusetts Supreme Judicial Court’s Access to Justice Commission. New Mexico Legal Aid (NMLA) is seeking an Executive Director to lead this nonprofit legal services organization that serves migrant, Native American and low-income populations throughout New Mexico. NMLA’s next Executive Director will facilitate and assist in the creation and implementation of a vision to bring NMLA to its next stage of development in advocacy, fiscal stability and collaboration with client communities and legal aid partners throughout the state. Visit www.nmlegalaid.org for the complete ED position announcement and the application process. Apply before July 22, 2011. NMLA is being assisted in the search by Patricia Pap, Executive Director, Management Information Exchange, 617-556-0288, ppap@m-i-e.org. Candidates with questions about the position or process are encouraged to contact her. Legal aid is about helping ordinary people with real-life problems. Client stories illustrate the day-to-day struggles—and victories—of low-income Americans seeking justice under law. Auda Hamilton, 73, would never have imagined herself speaking to a large group of attorneys about the benefits of pro bono and how she was rescued from mounting debt and given a fresh financial start in life, but that is exactly what she did. . . . Auda told her story to a room full of lawyers at the monthly Smith County [Texas] Bar Association CLE presentation. After her husband died of cancer and she herself was diagnosed with two brain tumors, Auda was forced to take medical retirement from her job, where she had been happily employed for over 23 years. Although Auda had always been able to work through any financial struggles that came her way in the past, a combination of the recession and her daughter's own financial troubles caused Auda to take on more and more credit card debt, resulting in a lower credit limit on her card and an increase in her interest rate to over 30%. Although Auda had previously considered herself an "unlikely candidate for legal aid," and did not even know that Lone Star Legal Aid existed until her daughter told her about the firm, she reluctantly made application last October for Chapter 7 Bankruptcy protection. Auda was referred to volunteer attorney Joe K. Thigpen of Thigpen & Raney, P.C. in Tyler. She told members of the Smith County Bar exactly how she felt when she first walked into Mr. Thigpen's office. " . . .[t]hat day was one of the worst days of my life. I felt like a failure…and now a beggar." However, she was pleasantly surprised by the graciousness shown to her by Mr. Thigpen and his staff….